Discussion in 'Civ6 - General Discussions' started by bite, Jan 15, 2019. Kudos to the developers - this one hits the mark for me go Sweden! Caprikel, WorldWarIV, bbbt and 10 others like this. We'll see in the demonstration just how strong that diplo bonus is from generating great people, diplomacy may still be just as viable as a victory for Sweden. I am confused by the Nobel Prize ability. It seems like it helps other civs a lot. How does it help Sweden? Is the idea that you also get to participate in more games and therefore have more chances to reap the benefits of them? I was leaning towards Sweden getting that unique governor. Guess it's likely the Ottomans now who get it? Along with another unique commercial hub because there seems to be a miscount. conorbebe, ferretbacon and Kimiimaro like this. I knew that they wouldn't totally get rid of England's old ability. They did the same thing with the Prora from Civ5 getting the Eiffel Tower's old abilities. Although here it's Civ abilities. +1 Great Engineer point per turn isn't enough to make me build factories TBH. I still think i'll only build Industrial Zonez when playing as Germany, Japan and The Netherlands or if I find a +5 or +6 spot. Bonus Great Scientists point from Universities is sweet though, I obviously always build Universities. I like Swedens Biblotechmathingy much more than the British Museum. As much as the BM was cool, it felt silly being able to build more than one. BM would work better as a Wonder. I was a bit irked when the British Museum was removed in GS, but it's nice that it has a replacement in the "Minerva of the North" ability. Plus Minerva of the North is there from the start of the game. What I'm really curious about is whether the Nobel Prize competitions trigger after Sweden is eliminated from the game. Good point. You'd think not. TahamiTsunami and acluewithout like this. The Carolean is a little weird and its ability is a bit ahistorical. The Caroleans were known for their highly aggressive attack favoring to get into melee as soon as possible and also carrying more melee weapons than their equivalents. They were not pike and shot however, they were line infantry. The tactics made sense as Sweden was a low population country so battles of attrition hurt them far more than their enemies, it was better to rout the enemy and end the battle as soon as possible. Caroleans (Swedish: karoliner) were soldiers of the Swedish kings Charles XI and Charles XII. Their tactics differed from those of Western Europe through a greater reliance upon pikes, rapiers, bayonets, and an offensive strategy, which lead them to victory in many battles, even when greatly outnumbered. Not too ahistorical considering this introduction. Plus, they were experts in forced march, so making them a fast moving anticav with that + strength for movement as a shock tactic makes sense IMO. Putting them at replacing Pike and Shot works quite well. Alexander's Hetaroi, AvianBritish, CPWimmer and 9 others like this. The goal of the price have strong synergies with Swedens abilities so Sweden have an easier time to win them. And winning the price for Sweden also mean more diplomatic favor because they get 50 each time they get a great person. Sweden only really need tons of underdeveloped cities each with a open air museum to produce ton of Culture and they can get their great work of arts slots from the UB amongst other. For Sweden each city should be Worth a minimum of 10 Culture per turn no matter how bad it is and I suspect that one of the price is about Culture. The Peace price is about diplomatic favor which fit Sweden because they get 50 each time they get a great person. CPWimmer and Eagle Pursuit like this. So Sweden wants to go out and settle desert? Seems strange to me. I like they went with something different though. CPWimmer, Trav'ling Canuck and Eagle Pursuit like this. Bonus for each type of terrain a swedish city is settled on? That just seems random to me, can't see the logic behind that. Also, wth. is an open air museum? An open-air museum is like a collection of buildings or a folk museum. I'm a bit curious about the inspiration for the terrain part. The song is an old drinking song, "helan går"
I learned this at a bachelor's party in Kentucky. That sentence was not supposed to make sense, though it was true.. I hit the mark fairly well I guess. 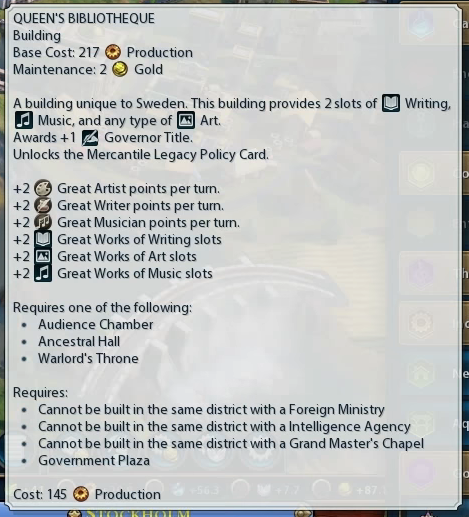 My guess of the Carolean as a unique unit was right and the open air museum (skans) was my second guess as unique building/district. I had also suspected Minerva of the North would be the name of her ability and some great people generation bonus being involved. Nice. What made you think of the open-air museum, if you don't mind me asking? AvianBritish, TahamiTsunami and Red_warning like this. I'd like to see Kristinas reaction to a declaration of war. Will she throw the book into the camera? Looking forward to this actually. Is it me, or she stares in your soul in the first few seconds of the video? That page turn though. Very creepy. She improves when she smiles and closes the book, however. And I like the book in the character model, really makes it work. But did they have problem with hands at Firaxis? Tamar's hands look too big and to heavy, while those of Kristina appear to thin and ridiculous, like toddler hands. They seem okay to me this time. Just about the right size. AvianBritish and TahamiTsunami like this. In a picture of the in game info popup. CPWimmer, TahamiTsunami, Stilgar08 and 2 others like this. So far, only Canada have bonuses to gain diplomatic favours directly ; Hungary, Greece and Georgia via city-States. I don't remember the great others ways, but there is onyl four others civs that can be dangerous competitors in diplomatic favours. For me, the gameplay mechanic behind Nobel Prizes are: we are giving to you a possibility to participate in a great competition you have more chance to win. Insteed giving them a flat, small, irrelevant bonus, they give them a great bonus but they'll have to fight for. An interesting design. Besides that, I don't care that Nobel Prizes competition are for everyone. Sweden is strong enough by itself without that. Au contraire, it's just an added flavour to spice your games. IMO, Sweden is THE civ you want in your game everytime since it's good for diversification and emergencies in World Congress. And another victory for logic! CPWimmer, TahamiTsunami and Jkchart like this. That particular leak has been wrong in multiple instances. The so far accurate leak has no mention of Roxolana, as far as I remember. AvianBritish, Alexander's Hetaroi, Meluhhan and 4 others like this. Seymour! You tyrannize like a girl! A handicapped one! CPWimmer, Harlequeen and TahamiTsunami like this. And remember, it's not like Sweden wins all the Nobel prizes, although I believe they do win more than their fair share, so it's a very appropriate bonus. I mean if you totally ignore it, it will likely hurt you, but other than that, even if it helps others you are gonna end up a net positive in the action. CPWimmer and Jkchart like this. Sweden looks good, very tight design this time. One thing that seems really odd is that all three Nobel Prize competitions are held in the Industrial Era. One per era starting in the Industrial would make more sense I think. @Denkt - Is your "Z" key broken? OzzyKP and TahamiTsunami like this.